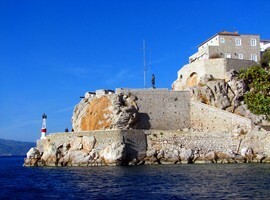 Hydra is an island in the Saronic Gulf. 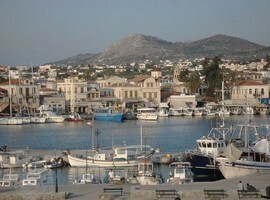 It is an extremely picturesque, aristocratic and cosmopolitan island. 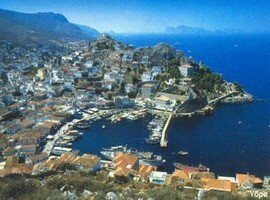 The island is famous for its natural beauty, the vibrant life and receives every year a large number of visitors. It owes its name to the abundant waters, gushing from the springs that had been there in antiquity. 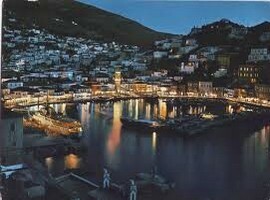 The town of Hydra is built in the middle of the northern coast, at the head of a closed bay surrounded by bare, rocky mountains. The visitors who approach it are first struck by the sight of a tall and imposing mansion overlooking the harbor city. 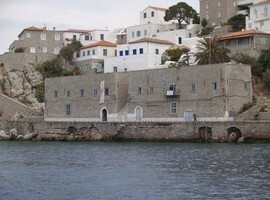 Right and left of the entrance of the harbor there are the bastions with cannons that protected the old city. 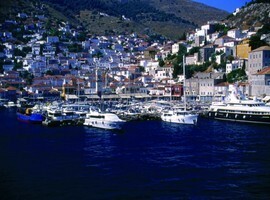 Today the port of Hydra is full of boats coming from every corner of the world. 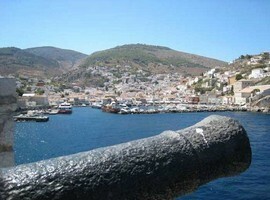 In Hydra there are no cars. In order to navigate the town you must either trust your legs or prefer the traditional donkeys. 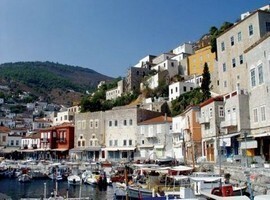 You can walk on the waterfront and admire the old mansions and visit the museums of Hydra. You can also ascend the narrow, picturesque streets and find yourself in the oldest district of the city, the medieval fortress town of Kiafas and from there to enjoy the view that reaches the Peloponnese. For swimming near the City you can go to the rocks of the cave, the Hydronetta and the groove, Kamini and cosmopolitan Mandraki. 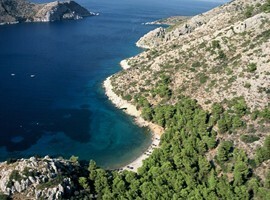 The connection of the town with other beautiful beaches such as Vlycho, St. Nicholas and Bisti is only possible by sea. 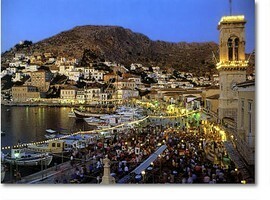 Hydra’s architecture is mainly represented by beautiful cobblestone streets and flower-decorated houses. 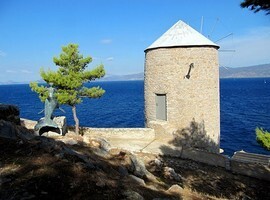 It is worth visiting the mansions of the island in order to admire the harbor from the hill. 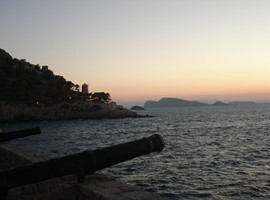 You can also admire the sunset from the Pavilion and the cave, and visit the 6 Monasteries and Churches 300 the island. 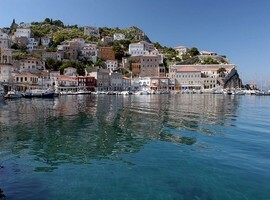 The beautiful beaches, along with gray rocks and the blue of the sea, give Hydra a wild beauty and make it an ideal place for inspiration and creation. 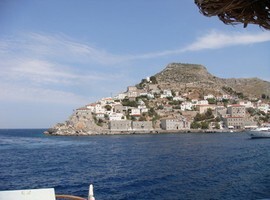 Hydra has many beaches with sand and pebbles or rocks. Access to these is possible by foot, donkey or boat. A common feature to all the beaches is that they are clean and have clear waters. At the head of the breakwater at the rocks outside the harbor there is the Cave. It is a busy rocky beach, ideal for diving in deep and clear water. 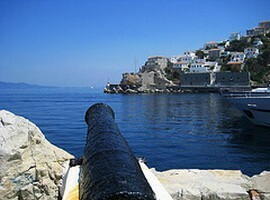 Next to it there is Hydronetta, located in the most beautiful part of the island, under the canons and on the rocks as well. After Hydronetta there is the groove. A beach full of pebbles illuminated at night and offers a magnificent sight. 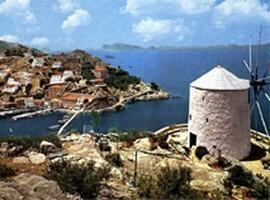 Following the coastal road, we arrive at Kiln, a small, natural, scenic harbor full of fishing boats. 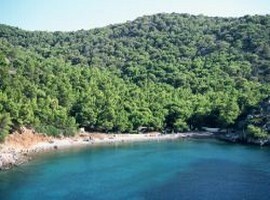 Attached is the Mikro Kamini, a lovely little pebble beach, ideal for small children and water sports. 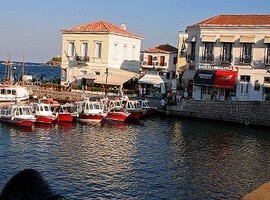 At Kamini you can find traditional tavernas. Following the coastal path, we arrive at the coastal settlement Vlychos. Vlychos is a beautiful beach with clear waters and white houses, perched on the rocks next to the church of Saint Charalambos. After 20 minutes walking and having come across a bridge from the 17th century of unique beauty, there is the coastal region of Bonito, a beautiful sandy beach. 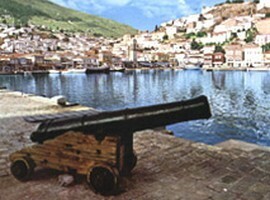 Mandraki is the old naval port. The entrance was kept by two old small castles were filled with guns. 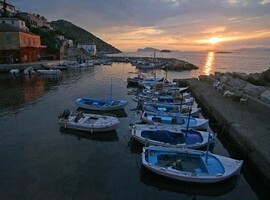 The town lies in a cove enclosed bay, has an organized beach with water sports facilities.